Hello and welcome to yet another episode of Coexisting With Nonhuman Animals. I've been lucky enough to be included on two Animal Rights shows recently, Wild Time, an Irish radio show, and also on the first episode of My Face Is On Fire. I've linked to the full episodes on my blog notes for this episode. I think its also worth briefing mentioning the gossip that heavyweight boxer Mike Tyson is now said to be Vegan. Celebrities who decide to try a vegan DIET are always troublesome, because if they decide to stop being Vegan, it can make Veganism appear as just a trendy fad. I listen to a few general interest podcasts that I would expect to cover Tysons apparent Veganism, but I guess that would damage the Vegan Stereotype. Non vegans have to promote the stereotypical tiny, weak Vegan who whines all the time, heavyweight boxers are not allowed to be considered Vegan. I notice that many people who were Vegetarian never have their dietary choices mentioned. Famous people such as Albert Einstein, Nikola Tesla, the man who practically invented everything to do with electricity and radio, or childhood heroes such as Mr Rogers. I personally find Fred Rogers quite interesting, heres a quote from the Fred Rogers Center "bedrock honesty ran throughout the man’s life. He treated everyone with the same respect and sensitivity that he knew had helped him as a child. And his strong moral code informed every aspect of his life, from how he lived to the community he chose for his family and work, even to what he ate. Fred was a vegetarian who told people, “I don’t want to eat anything that has a mother.”"
Often it is not mentioned if celebrities past were vegetarian or vegan. I'm sure Mr Rogers wore wool and leather, and I believe he had fish on the show. I think many well known vegetarians would be Vegan if they were properly informed. Sadly, Vegetarians and Vegans are commonly portrayed as nut jobs who scream "meat is murder" and throw red paint at people wearing fur, while avoiding those wearing leather. By appearing sensible, and even tempered, I hope stereotypes of those radical crazy vegans will be quashed. I often wonder if people can understand what I'm saying, its part of the reason I post each episodes script on my blog, problems understanding the New Zealand accent arose with Justin Bieber recently. He appeared on C4, which is New Zealand's rip off of MTV. I hope you understand who I'm meaning, Justin Bieber, that annoying little guy who's stolen the hearts of every preteen girl worldwide. The host was apparently talking another language to poor Bieber. I like that, "uh, jew man for basketball?, we don't say that in america". Apparently, the poor kid thought the host was saying "jew man", now I'm not sure if anyone listening can understand what *I'm* trying to say, Jew Man, a man, a male, who is Jewish, a Jew Man, when the host had really said "german", as in "Germany", um, not Jew Many, or Many Jews but, the country known for BMW and Mercedes Benz luxury cars. Now I'm actually worried that nobody can understand me… I'd love to get any emails from any English understanding listeners who have no idea what I'm yammering on about in my New Zealand Accent. Not all New Zealanders talk as crazy as I do, I have a "southland" accent, I do some wacky rolling rrrrrrrrrrrrr thing, its from a Scottish influence in my region, and so I mutilate words like "murder", Southlanderrrrrs murrrrrrdurrrrr the English language. I'm going to try and avoid the anything with an 'r' in future. I cant hear myself doing it, I don't think I'd ever recognize any other Southlander through the rrrrrrrr thing, but it is a VERY noticeable annoyance to other New Zealanders. I have gotten an email from a friend, who shall remain nameless, who misheard my pronunciation of "no agenda". , I think she heard my "no agenda" as "noa jingo". This could have just been a simple slip of memory, I often jumble up website or podcast names, or it could have been the way I talk. I think blaming the misunderstanding on my accent is funnier. I promise this podcast is actually about Animal Rights, but I have one last clip to play. I was listening to Enders Game, a great classic, and the most legendary character is mentioned as being a New Zealander, which I thought was pretty cool. I suppose the American author wanted a cool sounding nationality that nobody had ever heard of, perhaps he spun a globe and randomly picked New Zealand. The clip begins by talking of the superiority of Jew Men, Jewish men, not German men, and then mentions Mazer Rakam. A half May-ORI Nu ZEEElindur? It would actually be a half Maori New Zealander. Maori seem to have a natural ability in space warfare, in the Star Wars prequels, all the clone army are made up of Temuera Morrison clones. I promise I'll bring up the topic of pronunciation later. I'd like to mention a message board discussion I came across in the farming section, about killing baby calves, unwanted for the unlawful crime of being born male. I often read and post on the TradeMe Message Board, as C4 is a New Zealand MTV rip off, TradeMe is essentially the New Zealand clone of eBay. eBay is actually barely used in New Zealand, one of the few countries in the world to not support eBay. We also tend to avoid Amazon, and don't ask us about Best Buy, Circuit City, Wal Mart, or Whole Foods. We don't have a clue what you mean. But this isn't a podcast about what NZ lacks that America has in abundance, such as iPads, I should get back on topic. We are looking at shooting all our unwanted calves this year instead of mucking around with a bobby lorry etc etc..... first i want to make sure its actually legal to do this.... and secondly i want to know if anyone does this.... Thanks"
Well, at least one Animal Lover happened to be reading. I also notice the term "open", as in not close minded. I've often been accused of being "closed" or "narrow minded", because I seem so against the idea of killing animals. I think being Vegan is actually being rather open minded, to go against the norms of society, for what you believe is just. we dont have the space for them. nore as the calf rearer do i want to muck around waisting good colostum on bobby calves. or my time on them that should be spend on the replacements." I feel I must point out that the word humane, h u m a n e is repeatedly spelt wrong, often h u m a i n, which is rather fun to read. I truly think Animal Welfare promotion has gotten us to a place where the word "humane" means "killing the animals, just make it quick". I don't know what the opposite would be, killing an animal slowly? That would slow the killing speed, bad for the slaughterhouse. "But you have to keep your head down a bit as a lot of town reared folk still think food has no relation to living creatures.. And some people save snails etc.."
I try and save all animals, I like saving worms from puddles, after rain, worms become stranded in puddles, since the water cannot drain through concrete. Its a good feeling to flip a struggling worm from its watery grave and onto someones lawn. You do look a bit crazy though, bending over in public and groping about in the gutters, to throw something at peoples lawns. "And if using a .22, make sure you have muzzle contact to put the shot in exactly the right place.. The last thing Dairy needs right now is another media show. "Would you be happy with Campbell live turning up to film it. Could you justify to the public what you are doing , and not just in the terms of dollars and cents. Practices like this do damage all dairy farmers reputation. At the end of the day this is as bad or worse than inductions. All we need now is someone to do there podcast and Hans Kriek to come along. Remember the Consumer has the final say"
Hey, I got a mention, "someone to do their podcast", thats me! I'm well known in the farming section as being a thorn in their side. I don't post anywhere online to be a troll, mostly I ask the farmers for their comments on current Animal Rights or Animal Welfare stories in the news. I would actually like to have one or two of them on my show, I suggest they could meet me on Skype, but so far, all their tough talk has been from safe behind their keyboards. I highly doubt I could be convinced that it WAS moral to kill or otherwise use animals for our pleasure, but it would be good to have a healthy debate on my show, instead of my lecturing about what I think is right. Other comments included some condemning the murder of day old babies, instead actually feeding them for four or five days, and then giving them a ticket on the so called "bobby truck". The Bobby Truck goes about farms, collecting week old calves to be taken to slaughter. I believe theres actually a cost to this, of about five dollars an animal to the farmer. The various parts of the animals are separated and sold. Other farmers mentioned this had the benefit of helping other industries out, such as the sale of "slink skins", the leather and fur from stillborn animals, or the calves killed within days. Incidentally, this apparently makes the softest leather around, its desired for fashion industries. Farmers for killing at a day old mention that theres not much of a difference in keeping someone alive for one day to be killed, or keeping him alive for a few days, to be killed. The result is almost exactly the same. I could keep reading comments for an hour. So, the general theme was it is inevitable that dairy farmers have to kill male calves within days of birth. Oh, as long as it was done quote "humanely". Who knows what that actually means, I suppose getting it over and done with quickly. Even the ways of killing the animals were ambiguous, some mention shooting the animals, I presume the gun is put to the animals head and they are shot, others mentioned using a Captive Bolt pistol, like at a slaughterhouse. The Captive Bolt would stun the animal, and then I suppose his throat is cut. These were the two main presumably "humane" ways of killing these baby male animals. Others mentioned taking to them with a hammer, or joked about selling them online for hunters Target Practice. Many of the farmers mentioned being disgusted by the thought of the quote "hammer jockeys", and that was I guess, an "inhumane" way to kill the animals. It had been brought up that the whole topic shouldn't be spoken of in public, as it was bad PR for the dairy industry, so who knows how many of the babies are killed quote "humanely" or otherwise. I don't think the animals care how we kill them, if we stun them first and cut their throat, if we shoot them in the head, or if we bludgeon them to death. They are all horrific to me, absolutely disgusting, the issue is not TREATMENT, but USE itself. I wont spend my time asking farmers to follow Temple Grandin designed finishing moves on animals, I actually want to help animals, so I promote Veganism. This is really no different than the grinding of day old male chicks, both are just simple facts of life of using animals as property, and cannot be avoided. It is simply not realistic to expect farmers would keep all male chickens. The roosters would be a giant so called "loss" to the farmers, while not producing eggs to quote "earn their keep" like the hens. Male calves, bulls, would also be a giant cost to the farmers, think of the amount of land used on the average dairy farm, if every male calf was allowed to live, TWICE as much land would be required. Both male chicks and male calves are seen as worthless, so they are killed as soon as possible. 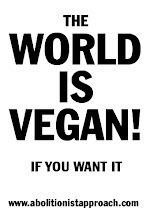 Veganism answers this problem, by avoiding any animal product, even those naturally plopped or oozed out (under unnatural conditions), so no animals are directly harmed. Cows are in our mainstream media for other reasons. My local newspaper, The Southland Times mentioned "Crackdown on straying stock"
"Police and the Southland District Council will take a hard line against farmers whose stock are found wandering on roads after a reported 13 crashes this year. Three drivers were injured in the crashes, seven of which involved cattle. Horse, sheep and deer were also involved. … the latest serious incident, officers were on Saturday called to deal with a "stroppy and aggressive" bull wandering in Oporo Flat Rd, near Wallacetown, that had tried to attack a cyclist. Stock control officers were called and they recognised the bull as one they had been called out to twice four days earlier. The owner could not be found so the bull was shot because of public safety fears." Most , if not quite all cattle in New Zealand are out on pasture, large green fields surrounded by fences. They are not living in battery cages or gestation crates, they live outside on green grass. They can move about freely, they have plenty of food, and also shelter if they want it. Within reason, I suppose theres no particular reason for cattle to escape, although perhaps the adage "the grass is always greener on the other side" comes into play. But its inevitable there will always be animals that manage to escape from their owners section. And when this happens, the last sentence of the article mentions animals being quote "impounded". Yeah right, as if the police are going to wrestle a giant animal into the back seat of a police car. Or as if they would have some way to impound the animal like a car, with some sort of clamp. No, the obvious thing thats going to happen with free running animals on public roads is that they will be shot, as I read before. Quote "the owner could not be found so the bull was shot because of public safety fears". These animals are just property, and they will be killed if found away from their farms. Of course, all animals used for farming end up dead in the end, they are kept alive until they are killed. No matter how green the grass, or how much room is given, I don't believe there is a quote "humane" way to keep animals as our property, and to kill them for our pleasure. Perhaps if I say it fast enough, my mistakes wont be noticed. Kereru. Or, I could just use the second name, "Wood Pigeon". Wood Pigeons are quite large birds, they are mostly green and white, and apparently rather rare in the North Island. They were historically hunted for our food. I've seen plenty where I live, at the bottom of the South Island, although they are obviously still unusual. I can often find them in the centre of Invercargill, right in the middle of the city, at the Otepuni Gardens. I'll link to the Wikipedia page for the Otepuni Gardens, I took the photos and created the article itself. Wood Pigeons are very unnerving birds, they are so large, most New Zealand birds that fly are small, Blackbird sized at most, with only large Seagulls and pigeons in larger cities filling out into a "rubenesque" stature. Perhaps thats a bit mean, those birds are naturally "big boned". Wood Pigeons live almost solely on fruiting trees and they are important to distribute larger seeds, that other birds cant swallow. When I've seen Wood Pigeons, they are always silent, and they blend in fairly well with their mostly green feathers. I'm going to be honest though, Wood Pigeons have always creeped me out, and not just because I cant say "kereru". The news story mentioned Wood Pigeons being a danger to drivers in Otatara, well, and obviously vehicles are a danger to the birds themselves. Otatara is a couple minutes from my house, its essentially a rural setting by the Invercargill Airport where there are practically no street lights or sewage pipes, everything is handled by septic tanks, and the houses are tucked away in the bush. So you are close to Invercargill city, and you also have native trees and bushwalks, with native birds. My best friend growing up lived in Otatara, and one afternoon, as his mother was driving me home, a Wood Pigeon startled us. Joanne had a little orange/red Ford, in New Zealand we'd say it was "jaffa" colored, J A F F A, after the orange chocolate lollies, it didn't have seat belts in the back seat, just a vinyl bench, so you could slide about on the corners. Regulations thankfully put a stop to that, but I don't remember if her car had rear seatbelts when….The Kereru attacked. We were in a small orange car, driving down the road, up and down gentle hills, when this mammoth green and white demon flew at the windscreen, it seemed to blot out the sky, it was no doubt as scared as we were. I think we all screamed as it breasted the windscreen and carried on its way. I don't remember if it actually touched the car or not, I was very young and as you should know by now, my imagination is vivid. Its hard to forget this giant bird that could have caused a serious accident, and so since these collisions are continuing to this day, its probably a very good thing to have warning signs about potentially drunk Wood Pigeons lazily zipping across roads at low heights. I'm glad to hear theres a Bird Sanctuary at Otatara, I never knew, and it doesn't seem to have a website, I'd love to visit sometime. I've linked to the video, and the recovering Wood Pigeons do look like very gentle animals, as they are lightly held, and as they eat peas and corn from a plate. Not only do these large potentially inebriated animals seem to leap out at cars, they have this creepy flapping noise, its sort of like a hollywood sound effect of a large knife being thrown, turning end over end as it flies past the camera in slow motion. Good old YouTube never lets me down, I've found a video with the sound. Most of the time, you wont notice a Wood Pigeon until you hear this horrifying sound. So, you are walking through the bush, or through public gardens, when you hear a god awful noise behind you, , you turn and see this giant green and white pigeon, surely on steroids, whizzing through the air. Now, my little Chicken Friends may have amber or even red eyes, but Wood Pigeons have BLOOD red eyes, not just Blood Red like say, white rabbits, but a deep, SATANIC Blood Red. I'm sure Wood Pigeons are lovely animals, they are quiet, they seem to have a green and white tuxedo, males and females stay together and they mainly live on fruit. But between the blood curdling flapping noise, which belongs with Vampire Bats in a B Movie, , and their Blood Red eyes, I've always found them unnerving. If I ever make a movie, it'll feature scary Wood Pigeons. Perhaps I'm just jealous of Australia for getting all the deadly animals, all the poison and fangs and venom and jaws. New Zealand is such a gentle country, most of our Native Birds forgot how to fly, there were no predators. Meanwhile, it seems most Australian plants, plants for petes sake, are venus fly traps, or they have spikes or are poisonous. It really is hell to live in a peaceful country like New Zealand. Maybe I just want to have a scary sounding New Zealand Native Bird. Oh, and I must mention that I'm afraid to pronounce the true name of Wood Pigeons, Kereru. Just as traffic can damage animals, so can animal waste damage water supplies. Many New Zealand rivers nationwide have now become polluted from runoff from the Dairy industry. I think most New Zealanders have heard the slogan "dirty dairy", its kind of like "factory farming", that some Dairy Farmers are out there dumping goodness knows what into creeks, rivers and streams. Many rivers are now unfit for swimming, again, many people in New Zealand might be harsh about Chinese factories, mentioning acrid smoke billowing out from massive chimneys, polluting cities, but we should realise that animal waste from Dairy farms has an affect on the New Zealand landscape as well. All New Zealanders are affected by the tainted water, including Vegans. I would make a comment to my friends living in the region, "drink up guys", but then I've realized that I'm further down the country, and even if I'm safe from Waikato Dairy runoff, Southland is also known for its Dairy industry. All those animals will always need to go potty, and so there will always be waterways being polluted as long as we engage in Dairy Farming. I'd like to mention one more thing, the story about Genetically Modified cows being killed because of serious defects has spread worldwide. Here is coverage from Australia. I should make a comment about my last episode. I was critical of PETA members on an official PETA podcast for pointing out that they enjoyed the taste of animal products. I received a comment that they were only being honest. I do apologize if I came across as harsh, I certainly have no desire to judge other people, I'm just some guy with a secondhand USB microphone. However, I still wouldn't mention that I liked the taste of animal products as I was telling other people about Veganism. "brutal killing of unwanted calves"